That Sir Paul McCartney played a pub in Liverpool has been watched by multiple millions of people the world round by now. The news leaked in a BBC news item two weeks ago. The item brought three gentlemen in a discussion that we of WoNoBlog are happy to share with you. Interesting how even now Macca still has the power to draw such intense interest from the media and public. Great to see this sort of thing happening in a pub (evidently took place at the The Philharmonic pub in central Liverpool) in this day and age? This will be screened on James Corden's (US) Late Late Show next week on Sky1… maybe worth watching. Thanks, Gary. Paul always seems up for that sort of thing - in London he's been seen on the tube (but not busking!). Down to earth - literally! John was the same in New York (but got shot). Paul also still has strong family links with Liverpool and he supports the Liverpool Institute for Performing Arts. The city generally loves him unlike Ringo - they haven't forgiven him for what he said on the Jonathan Ross show about not missing the city - in 2008 the Liverpool city of culture year! I went to the Beatles week in Liverpool last year. The statue of the group down at the Pier Head in the photo with Paul is great - really captures the spirit of the group (based on a photo). There's also a great statue of Billy Fury at the Albert Dock and a new one of Cilla Black in Mathew Street standing outside the Cavern - not the original club alas which was knocked down by the Council in the 1970s when they had no sense of the musical heritage under their feet - again literally in the case of the Cavern! Cilla worked in the cloakroom at the club but would sometimes be invited on stage to sing with the Beatles - and they later gave her a couple of hit songs (Love of the Loved, It's For You and Step Inside Love). 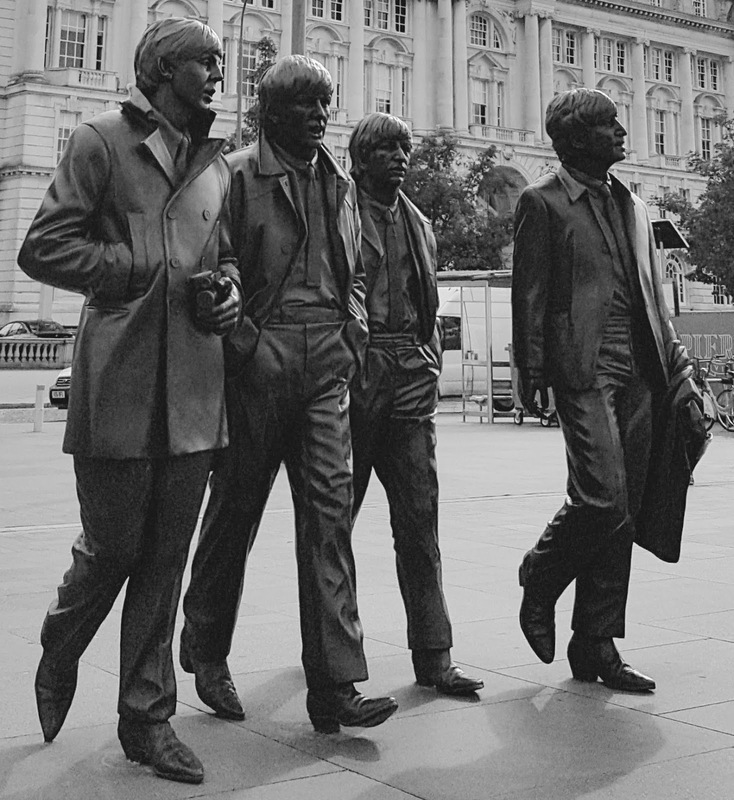 Liverpool is better now at recognising its home-grown heroes - and in the case of the Beatles it's become a huge money-earner from tourism. 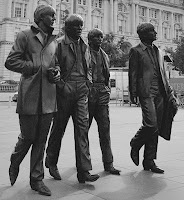 I just read a blog of a Dutch Beatles fanatic who went on a pilgrimage to Hamburg with a few other real fans. Apparently there's a Beatles five piece memorial on the intersection of Reeperbahn and Grosse Freiheit, the two streets they played 1960-1962. Stuart Sutcliffe is set somewhat apart from the other four, including Pete Best of course. They assumed that is because he stayed behind with Astrid. These fellows and a lady also sort of broke into the building where the Beatles slept behind the screen of the adult movie theatre in their first Hamburg weeks, to have a peak. All cities have their stories, but there's only one original. It is amazing the Cavern Club was torn down, as the Beatles were already venerated in the 70s. What no one could have predicted is the sort of pilgrimages fans would undertake. (And the aldermen and civil servants deciding on these topics were probably too old to have been fans.) Was there a sign on the side of a building in Salzburg in 1830 saying Mozart lived here? Probably not. In the mid 80s of the last century there was. And so it is with the Beatles nowadays and many other 60s heroes. I should do my Liverpool trip one of these days. P.S. It's a three story piece, that ends quite nice, but also shows some fans just go too far, really. Attached are a couple of photos from a trip to Hamburg I did a couple of years ago. The Reeperbahn and Grosse Freiheit street where the music clubs were haven't changed much but the original Star Club burnt down quite a few years ago so nothing left of that main club where the Merseybeat groups all played. I'm standing in the doorway exactly where John stood in the 1961 photo on his Rock'n'roll elpee. Difficult to find - and the locals get pissed off with the Beatle fans who do persevere and find it! I also attach a photo of a very good statue of John in a Havana park that was unveiled by Fidel Castro. His granny specs kept getting nicked so they pay an old bloke to keep any eye on him. Back in Liddypool, attached are a couple of photos of the new statue - dig Paul's winkle-pickers - and one of an earlier one of John in Mathew Street which originally had him sporting a rock'n'roll quiff but the moptop was substituted after tourists complained they didn't recognise him! Mathew Street is now a tourist trap mess alas: I remember going there in 1971 when it was a dingy backstreet of warehouses. Good for the economy though I suppose. I also came across a blow up John during a street carnival in Malta back in January! The Cavern Club was demolished unnecessarily: the club had long closed and the plan was to build a ventilation shaft on the site for the city's underground railway - but that shaft was never actually built. The bricks were sold off for a few quid each - worth a lot more now! You never stop amazing me where you have been over the years, Mark, and the hunt for historical places connected to 60s acts. I have to admit to not being that diligent, but also, at least in part, because it just doesn't cross my mind. If I look back to what I have done. The first is probably walking through London to see Battersea Powerstation in 1978 (not the Abbey Road crossing), Jim Morrison's grave in Père Lachaise in 1986. Sitting in the Cafe Wha? and the Kettle of Fish in 1992, Hendrix' grave in Renton in 2003. The Yellow Submarine I saw at Liverpool airport from the car on route to the Lake District some years back. That may just be it. BTW, I saw a picture of the Abbey Road crossing being demolished by a road crew last week, leading to consternation on the Internet. I have been told long ago that this wasn't the original crossing any way. So the next will probably become just as iconic as the first and the second one soon. Looking at the photo's of Macca, 76 today, in a pub in Liverpool is amazing. To think that there were some lucky people who attended this mini show! Some have all the luck. 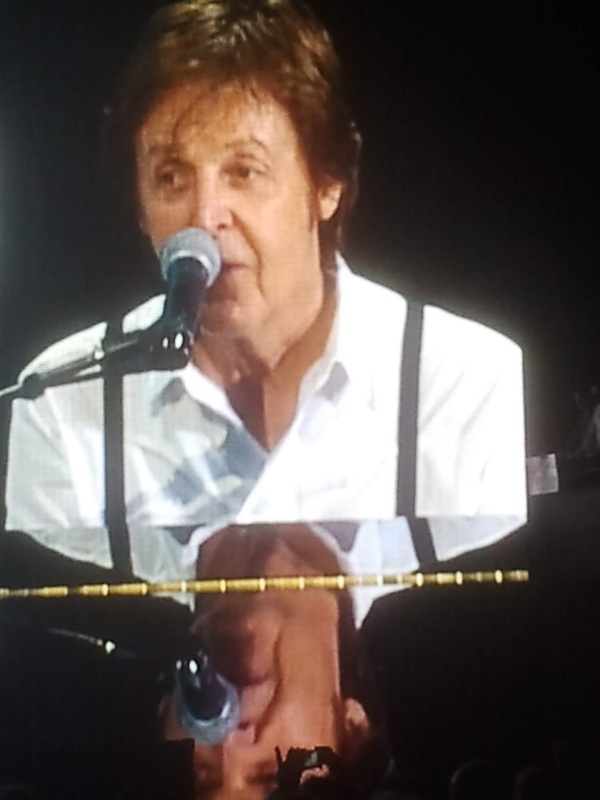 I count my lucky stars to have seen him in 2012. A very emotional show, I have to admit as a lot of things all came together that evening. My niece who introduced me to the band as a very young boy, my son who is a huge Beatles fan through me and my best friend around me and the music that is there for nearly a lifetime as well. It was sort of overwhelming. With Sir Paul in great form. And then imagine all the huge hits he did not play that evening. It all ended or nearly ended with 'Hey Jude', which was my first self bought 45. Some more tears alright accompanying the first notes. I'm still sort of proud to be able to write this: 'Hey Jude' as a first 45. It could have been a lot worse to have to admit that 50 years later. With 'Revolution' exposing me to a totally different and for me, then, unknown side of The Beatles. 76. How much more years can we enjoy his presence and love of music? I just received an e-mail from the same cousin I mentioned in my last e-mail, with a message announcing a new Macca album, called Egypt Station. 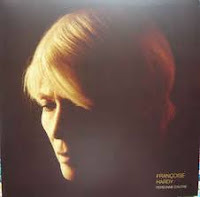 Now I haven't been warming to most of McCartney's albums in the past 25 years, it is always something to look out for. 'Flaming Pie' may have been the last one I truly liked in fact. Yes I've just seen the news too. It's several years since his last album so one hopes that the songs on it will be the best and most developed of whatever he has been working on in this relatively long period of no releases. His albums always sell well at the time of release because of who he is and the solid base of Beatles fans and completists who buy his records regardless (like me....!). But he is not averse to experimenting and reaching out to younger talents and spreading his profile which is a good approach for a multi-millionaire artist to take in order to keep in touch with reality and changes. However these efforts tend to be one-offs and he risks sinking back into complacency and nothing happens for a while - and in the meantime he's distracted by touring the world singing Hey Jude etc. I wonder if he went back into a proper band that might sharpen up his writing and he'd benefit from other members telling him "come on Paul, that's a load of crap, why don't you do it this way?" or " I've got a riff that I've been working on that might work here, Paul" - which is how it often worked in the Beatles. Trouble is it couldn't be like re-inventing The Beatles because really talented potential band members would likely be put off by the stigma of always being in Paul's shadow and prefer pursuing their own independent ambitions. Look what happened to Denny Laine: undoubtedly talented but after falling out with Paul and the end of Wings he had no career and ended up bankrupt. That said it is not unknown for Paul's records to be re-assessed - such as Ram which I've always loved for its rich diversity but it was slammed for being lightweight at the time John was at his peak with Imagine. The album Paul did in collaboration with Elvis Costello was a peak though that was a partnership that could not possibly continue given Costello's stature as a writer/artist/performer in his own write - sorry! - right! Flowers in the Dirt was a McCartney album, not credited as the Costello-McCartney album it should perhaps have been (I've heard the multi-cd archives version with additional tracks that they worked is well worth the investment). Final point:: the title "Egypt Station" sounds intrigueing and potentially exciting in musical terms but I expect it's meaningless! Here it is! https://youtu.be/QjvzCTqkBDQ Enjoy! Thanks Gary -and I also saw it on yer actual proper telly, like. I note the last great moptop is now wisely easing off on the hair dye in his 76th year. I've been to the house in Forthlin Road which is a faithfully restored basic council house open to the public and is quite a contrast to the big suburban semi in Menlove Avenue where John grew up (the working class hero worked hard to shake off his middle class roots). George and Ringo grew up in similar modest terrace houses originally with outside toilets next to the back alley. Quite remarkable if Paul knocking on the door - over 50 years after moving out: oh alright, go on, "Let 'em In" - was entirely un-staged. I wonder if he'll attempt an autobiography before he forgets too much more of the really interesting detail - it's pretty much all been written for him in the dozens of biographies, one or two of which claim his fabness' approval like Philip Norman's. Though it's rather self-sanitised, I recommend the massive Anthology tome with its fascinating illustrations. Speaking of ageing musical icons who are just about hanging in there, I finally bought Françoise Hardy's new album while changing trains in Paris last week en route to Strasbourg. There are a couple of excellent records shops on the Grand Rue in Strasbourg - "Oncle Tom's" and "Thirty and Co". I picked up Steve Earle's latest album from last year So You Wanna Be An Outlaw (I'm seeing him in concert in London next month) and a vinyl reissue of Rory Gallagher's album Tattoo. That is me revisiting my youth: I saw Rory play at my first proper rock concert in 1973 at the Liverpool Stadium which was a notorious boxing ring now demolished. Also I'm restoring to my record collection this excellent blues/rock album - perhaps Rory at his peak - after a vicious austerity cull I had to institute in the early 1980s when I was skint. Sobering to read, as I have just done, that almost all of Rory's side-men on bass, keyboards and drums have now followed him through the pearly gates to the great gig in the sky. By the way, I also dropped into Brussels last week to try to talk the Commission out of their intention to cut (we believe) 200,000 UK companies out of .eu next March if there is no deal. The total number of UK-based registrations is 317,000 which is 9% and 4th largest EU MS in terms of .eu registrations - so EurID aren't exactly pleased either. Meanwhile the Commission risk losing that useful 1mill euro surplus from .eu (and for my efforts I got pick-pocketed on the way back to Brussels Midi). What an incredible video with Macca in his old hometown! Of course nothing in there is truly spontaneous, but that does not mean that the intentions are totally true and well-meant. It does show a little where he's from and where some of the songs originated. The pub show is a real enactment of the 'Let It Be' rooftop concert, with one main difference: there was an audience to start with. If they really were this lucky we'll never know. The people that came running in certainly were. I had never heard of the talkshow host, James Corden, nor his Carpool Karaoke, but he really does all this well prepared, fully good-humoured and with love for the music of his guest. What he manages to show his audience is twofold: the love of music Paul McCartney has at the depth of his heart and the love and respect he receives from people the world over who respond to his music. This did not last for 10 years, as The Beatles thought at the time, but will outlive him for decades if not hundreds of years. Have you heard the new single, 'Come On To Me'? I honestly think it may be his best since the 70s. What an energy, what fun. 100% alive, enjoying life and exuberant, bubbling and bursting with energy. The second song released is 'I Don't Know', a much more serious ballad, not unlike 'Ebony And Ivory'. Yes, his voice is audibly ageing now, but at 75/76 it is allowed to. The music is what counts. If these songs are the standard of 'Egypt Station', we have a great album waiting for us after the summer. Sorry to read about your wallet, Mark. Always a bit of a shock when a thing like that happens, not to mention all the time lost afterwards. I, unfortunately, can speak from experience. Last Sunday we had another living room show. It was so beautiful, once again. The band, Maggie Brown, managed to draw pure emotions from the people present. They moved all, while most present had never heard of the band before. It is an honour to stage shows like this, I can tell you, for more than one reason. Any The Beatles fan should listen to 'Hail To The Rain' by Maggie Brown. The song is so beautiful.